*Revolution Race Group is a race team on iRacing.com's Simulation Motorsport service. Currently competing for a Championship in the 2014 Season 2 Mustang FR500 Challenge Series. Joe Pisciotta Jr - Team Principle, Car Chief, Spotter. Jared Jewell - 2nd Place & 2nd Place in the Standings. Mike Wille - 5th Place & 3rd Place in the Standings. Todd Honczarenko - Off this week & 10th Place in the Standings. Heading into Race 11 out of 12 Jared Jewell had led the Mustang Challenge Series point Standings for most of the season while teammate Mike Wille remained idle in 3rd place. At Bathurst points leader Patrick Bieri started on Pole, Kester Baird (last weeks winner) starting 2nd while Mike Wille 3rd and teammate Jared Jewell in 4th. As the green flag dropped drafting started right away on the long straight heading into turn 1 and I don't know how they all made it through without incident but it must be from 10 weeks of quality racing. Right away Bieri started to pull away from the field while Wille and Jewell disposed of Baird rather quickly to snag second and third place. The race order did not change for 6 laps until suddenly one of the narrow walls grabbed ahold of Mike Wille's FR500 Mustang which cause steering damage. Luckily Jared Jewell got by his teammate without touching and the gap to close to Bieri was 4 seconds with 5 laps to go. Wille's damage caused him to slow in several turns to the point he surrendered a few positions back to 5th. Jewell was unable to match the speed of Bieri and finished 16.55 seconds behind in 2nd place. With only one race left to decide the Championship, Jewell will need to score 230 points next race at Mosport and Bieri will need to finish 3rd or worse. It looks like Mike Wille will finish the Championship on the podium in 3rd even with a race left. Considering Revolution Race Group just formed a few months ago we have made huge steps to compete next season for a Season 3 Championship in the Mustang Challenge. Mustang Challenge Series Points from race 11 finish at Bathurst. Watch Jared Jewell wheel his Stangnet / Late Model Restoration FR500 at Bathurst during race 11 of 12. 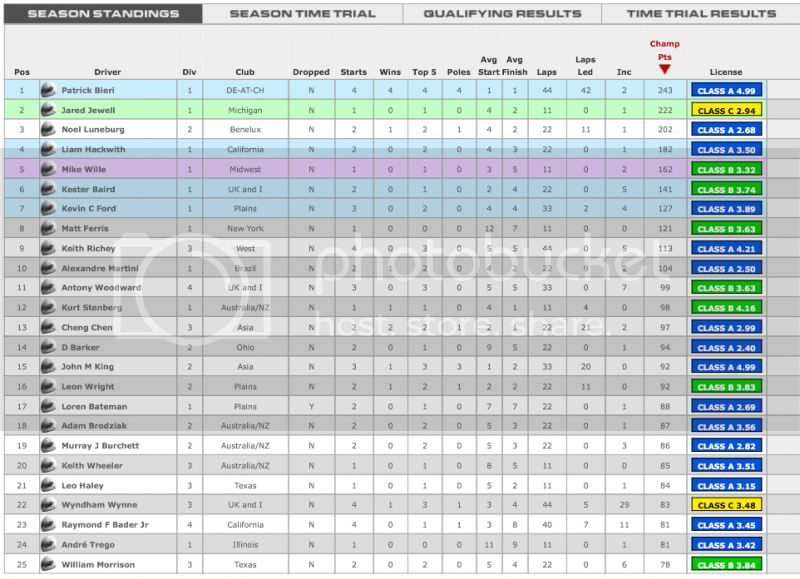 The race may have been Down Under but Patrick Bieri’s performance was over-the-top in Week 11 of the iRacing.com Mustang Challenge. The defending Season 1 Champion showed he has continued to get better in Season 2 by setting the top qualifying time of the week (2:27.493) by nearly a half-second over any other Mustang sim-racer at Mount Panorama Circuit in Bathurst. Bieri capitalized on the pole position advantage by winning all four of the races he entered including the crucial “Strength-of-Field” race on Sunday at 20:15GMT against the best in the series. Mike Wille (#5) leads teammate Jared Jewell (#2), Kester Baird (#3), Liam Hackwith (#4) and others in an effort to chase down Patrick Bieri in the opening laps at Mount Panorama Circuit. Nearly as impressive was the speed with which Revolution Race Group driver Jared Jewell learned the tricky 23 turns having never run at Bathurst. After leading the overall points standings for several weeks, Jewell came into Week 11 trailing Bieri and needing to keep the points close before the final showdown in Week 12 at Mosport. In his debut race at the track, which also happened to be the Sunday SOF race, Jewell methodically moved from his fourth place starting spot all the way to second in just 11 laps without a scratch on the car, finishing behind Bieri. Sparks flew at Bathurst in Week 11 as drivers like Noel Luneburg challenged the limits of their nerves and their Mustangs in an effort to earn all-important points before the close of Season 2. Not far behind Jewell, a classic Mustang Challenge battle ensued between Noel Luneburg, Liam Hackwith, Mike Wille and Kester Baird. Baird and Hackwith ran nose-to-tail for several laps trying to keep up with Wille and Jewell who were running in second and third, before a grass excursion by Baird exiting The Chase slowed both drivers allowing Luneburg to jump two spots to fourth. Wille held down second place for half the race before contact with the walls in The Esses allowed Jewell to slip by, followed on the next lap by Luneburg and Hackwith. Luneburg closed to within 2.5 seconds of Jewell to claim the final podium spot, with Hackwith just three seconds further back. As the green flag flies to start the race, Kester Baird (#3) challenges Mike Wille (#5) into Turn 1 at Bathurst. Alexandre Martini(#2) chases Liam Hackwith (#3) during Friday’s 22:15GMT race at Bathurst. 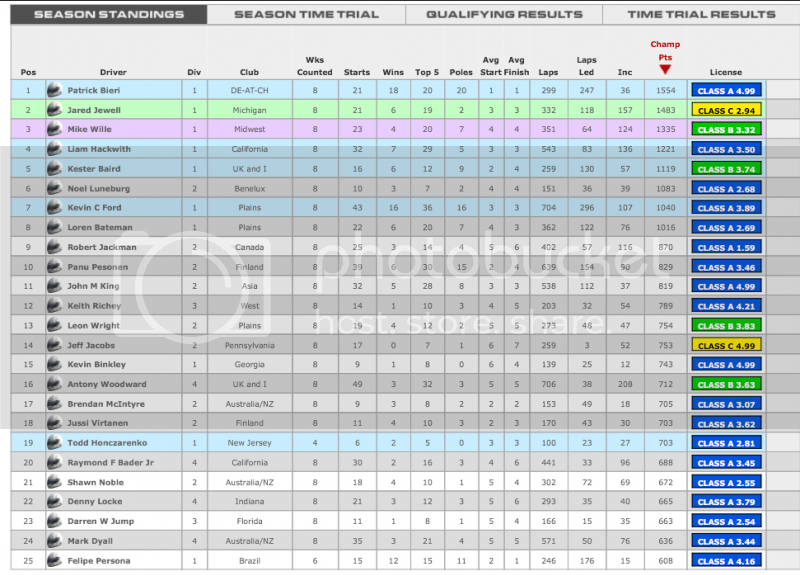 Going into the final week of Season 2 , the championship points shapes up as follows: Bieri 1554, Jewell 1483 (-71), Wille 1335 (-148), Hackwith 1221 (-114), Baird 1119 (-102), Luneburg 1083 (-36), Kevin Ford 1040 (-43), and Loren Bateman 1016 (-24). Jewell will need a win in a big SOF race in Week 12 at Mosport combined with an uncharacteristically poor finish by Bieri to prevent a repeat Championship. Wille also appears a lock for the final podium spot, but there will likely be a fevered battle between Baird, Luneburg, Ford and Bateman for the final position in the Top 5. With the advantage of the inside line in Turn 1, Patrick Bieri (#1) capitalized on his top qualifying time and pole position to win each of the four races he entered in Week 11 at Bathurst. The final week of what has been announced as the final season of the Mustang Challenge series (more on that in a future article) will take place at Mosport. Initial practice is showing fast weather conditions that are favorable to knocking off the current World Records set by Vedran Broz just last season. His World Record qualifying run was a 1:29.076, and his record race lap was a 1:29.107. All drivers will find helpful set-up tips, a lap guide, track map, a video of Broz’s record qualifying lap, and other helpful tips in the Series Forum. Pictures of the action to come soon. iRacing.com Mustang Challenge Race Team - Revolution Race Group.